In a recent article on the 3 causes of marketing failure, I explained that your business marketing efforts fail when you don’t get enough traffic, or enough conversions, or when you aren’t properly tracking your return on investment (ROI). We refer to Traffic, Conversion and Tracking as “The 3 Pillars” because you really need all 3 in place to profit over the long term. But now, I want to talk about how you can get more web traffic, which is a key aspect of any strong online marketing plan. There are tons of options, and I realize that sometimes all those options can get overwhelming. So, in this article, I’m going to break traffic down into just four simple categories. Search engine optimization is the process of getting web pages to rank at the top of search engines like Google. Many people consider SEO to be the holy grail of online marketing, and it’s easy to see why: when you’re ranking on the top of the search engines, you can get a recurring stream of new traffic and customers. Search advertising: Google Adwords, MSN AdCenter, etc. Display advertising: Google Display Network, Facebook, retargeting, etc. The big benefit of advertising is SPEED — you can get a campaign live and start getting new clicks almost immediately. Another major category of online traffic is social media. No matter what business you’re in, your potential customers are spending time on websites like Facebook, LinkedIn, YouTube, Twitter, and Pinterest, or on blogs, or on review websites like Yelp. Like SEO, the big benefit of social media is that it’s free. And the first (and extremely basic) step to getting traffic with social media is to simply show up where your potential customers are already hanging out. Customer referral programs: where you create incentives for your customers to refer other customers to your business. The big benefit of referral marketing is that referrals are typically the highest-converting traffic (i.e., it’s most likely to convert into leads and sales). NEVER RELY ON JUST ONE SOURCE OF TRAFFIC! You never want to rely on just one source of traffic, because if you are dependent on just one source, your business will be unstable and vulnerable. For example, if you’re relying on Google ranking (SEO) for all your customers, you could go out of business overnight if Google changes their algorithm. The good news is that EVERY business with a website can take advantage of all four of these traffic sources. So if you’re currently relying on just one or two sources of traffic, you know what to do. First, assess your current marketing activities: Are you using all four traffic sources, or are you missing some? If you’re missing any, then make sure you include all four in your marketing plan over the next 30-90 days. By adding new sources of traffic, you’ll not only get more traffic and customers in the short term, but you’ll gain more stability in your business over the long term. Pete Kennedy is Co-Founder of Main Street ROI, a company that teaches internet marketing strategies that actually work for small businesses. Want more online marketing tips? 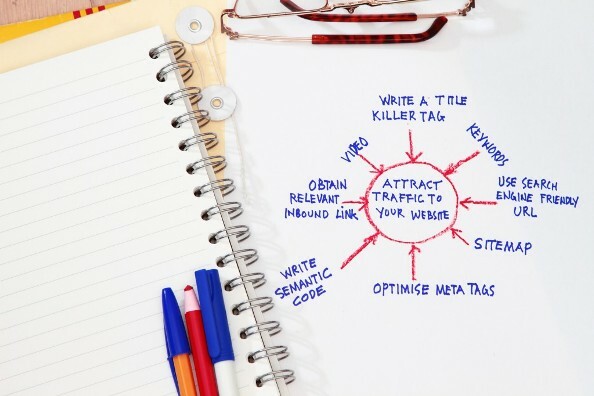 Click here to get the Ultimate SEO Checklist to rank your website higher in Google.